mommy bytes: vi Rocks! And so does xkcd! vi Rocks! And so does xkcd! 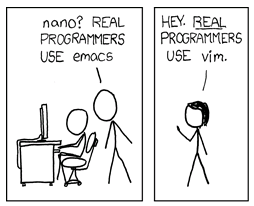 Right on the heels of my geeky jokes, xkcd comes out with this awesome comic on Real Programmers. I was never an emacs fan, but I loved vi and its quirky commands like ZZ and q! (save and quit, quit without saving). Best of all, the navigation keys h,j,k,l (left, down, up, right) were exactly the same keys used in larn. OMG, I'm really getting my inner geek on!! Hey...that's all Unix talk....I thought you were a Windows Programmer?!? !